You can’t figure out what Seattle coach Pete Carroll was thinking when he called for that ill-fated pass play during the Super Bowl? How do you think we feel when we can’t figure out who all these local campaign buttons refer to?? As you know, every so often we come across campaign buttons for candidates we’ve never heard of. How do we identify who they are? And when we see a “Smith for Congress” or a “Jones for Senator” button, well, how do we know which Smith or which Jones? That’s where you come in. 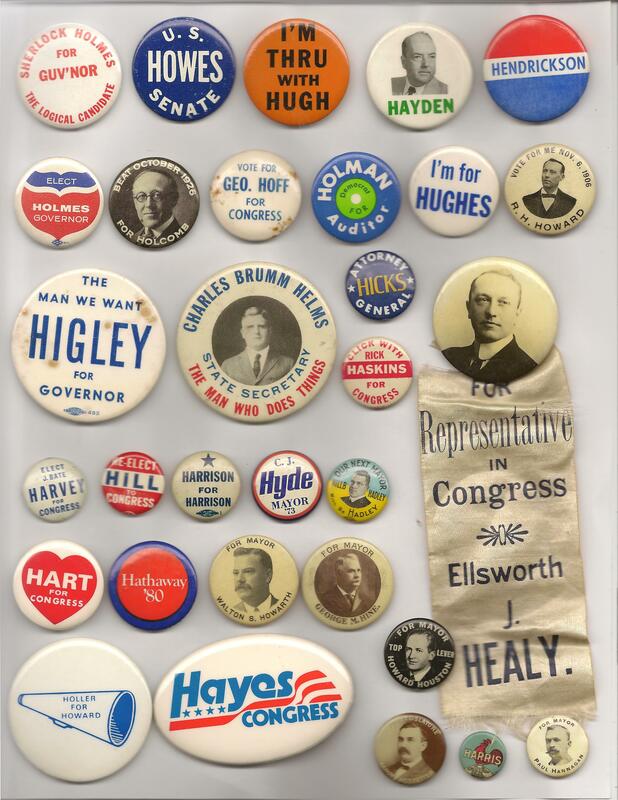 We’ve been offering photos of these unknown buttons (arranged alphabetically by candidate names) for you to help identify. You’ve been doing an amazing job, for which we are very thankful. (Previous “Who Dats”: Unknowns beginning with the Letter A, Letter B, two pages for Letter C (here and here), Letter D, Letter E, Letter F and Letter G.
And now we’re back with another selection of campaign items of candidates, this time focusing on the letter “H.” As in, HELP US! First line: Howes is Maryland. Second line: Holman for Auditor may be Missouri. Third line: Charles Brumm Helms was the state secretary for the Patriotic Order Sons of America. Is this political? The “Ellsworth Healy for Congress” picture/ribbon item is from the Bronx, N.Y. in 1915. Fourth line: J. Bate Harvey may be South Carolina. C.J. Hyde for mayor is the losing Republican candidate in Louisville, Ky., 1973. Will B. Hadley for mayor may be Philadelphia. Fifth line: Howarth for mayor may be Newark, N.J. George Hine for mayor is Poughkeepsie, N.Y.
Sixth line: The oval Hayes for Congress is Maine 1988. Howard Houston for mayor is thought to be Meriden, Conn. Paul Hannagan for mayor is Lawrence, Mass. Aaron Hostetter for legislature may be Pennsylvania. And don’t you love the thought of the rooster button being for Chick Harris? First line: John Howard for executive council is New Hampshire. Assuming Heimann for Assembly is NY, but where? Hattie for Alderman is Chicago. 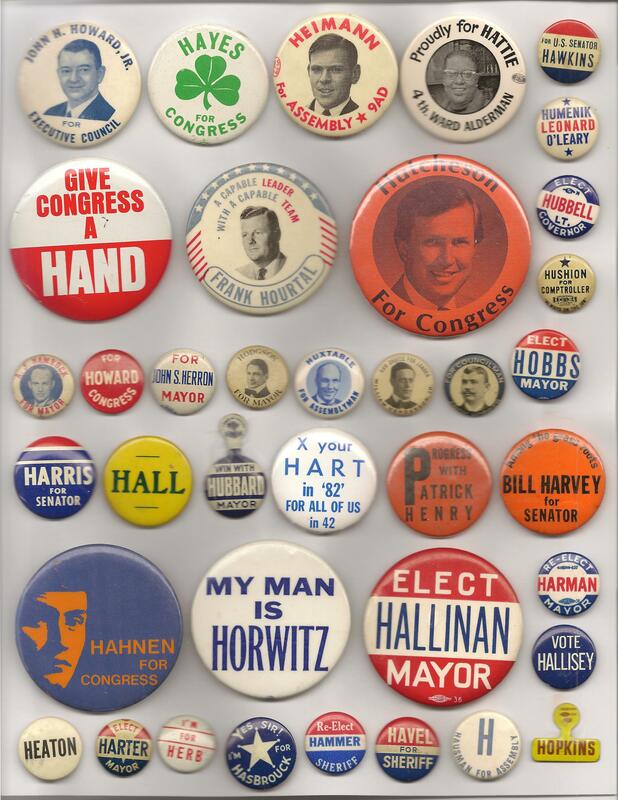 The Hawkins for US Senator is thought to be from Louisiana, but it was manufactured by a Baltimore button company. +++The Leonard/Humenik/O’Leary item is a mayor and council item from Garwood, N.J. in Union County. Hubbell for LG could be Michigan. Hushion for Comptroller is thought to be Yonkers, N.Y.
Third line: John Herron for mayor is Pittsburgh. Fourth line: Hall has Los Angeles back paper. Fifth line: Hahnen for Congress could be Minnesota. The Hutcheson is Colorado…think it is from ’78 but could be from 1980. The green & white Hayes I believe to be from 1974-Rep. Philip Hayes. I found this on the Friends of the Upper East Side web page – John Heimann is an investment banker, former New York State Supervisor of Banking and Commissioner of Housing and Community Development, and was appointed by President Jimmy Carter to be Comptroller of the Currency. In the fall of 1964 Heimann was running for the New York State Assembly and helped to form the Committee to Save the Brokaw Mansion and get the Landmarks Law passed. Hallinan must refer to Vincent Hallinan , a committed millionair socialist, atheist and s___ disturber is San Francisco. A good guy. His son Patrick was SF DA for A while. Frank Hourtal was president of IBEW local 1470 in New Jersey in the 1960s. The Holman for Auditor button is ABSOLUTELY a Missouri pin. It’s Haskell Holman, a Democrat from Missouri who served for many terms as Auditor of the State of Missouri. This button would have been from his last campaign. I may not have the service dates correct, but I think he served from about 1953 until 1971. Kit Bond, who later became both Governor and Senator of Missouri followed him in the post. It’s an authentic button. Ellsworth J. Healy, pictured on the pin with the great ribbon, is another Democrat, and was a candidate for congress in what was then the 23rd District of New York in the 1914- 1916 timeframe. “Elect Harter Mayor” — probably Akron. Two possibilities here: George J. Harter, Democrat, elected in 1941 and defeated in 1943, or State Rep. Fred D. Harter, unsuccessful Democratic nominee for mayor in 1947 and 1951. Yes, Higley is Wisconsin. I have one and come across this button rarely here in Wisconsin. Later, Harvey Higley served as Richard Nixons Chair of his 1960 WI committee for Nixon for president, for the April open primary.